The best SAAB 9-5 performance intercooler kit on the market! - Airflow optimized intercooler pipes with CNC-machined sensor fastenings. - Special designed silicone hoses with 3-4 layers of armory for optimal fitment and durability. - High quality, stainless hose clamps. - Delivered with mounting instructions, screws, washers, nuts and everything necessary for an easy, straight-forward installation. 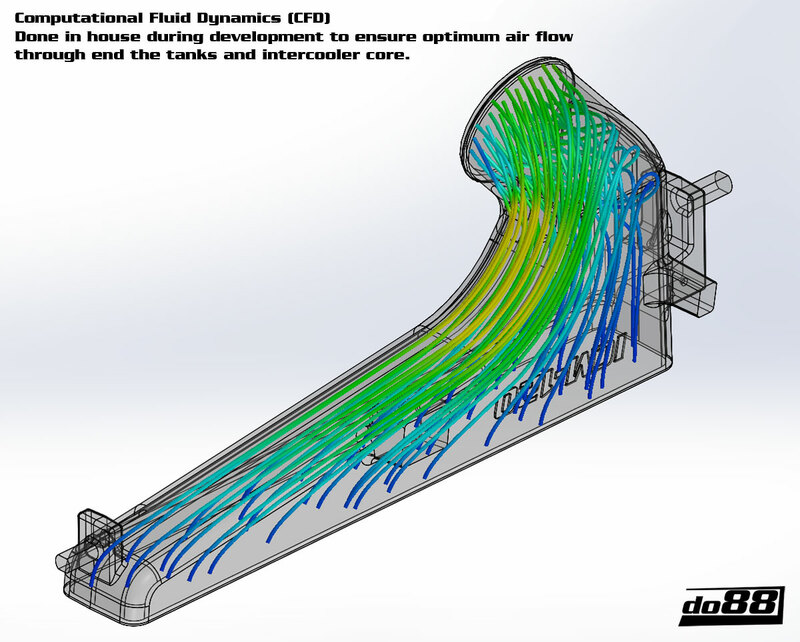 - Airflow-verified in the SuperFlow SF-1020 flow bench. The 85 % increased and 40 % core volume is an achievement we are proud of. It's a remarkable difference. Perceivable, to say the least. The engine pulls better all over the revs and withstands repeated full throttle runs without building heat. 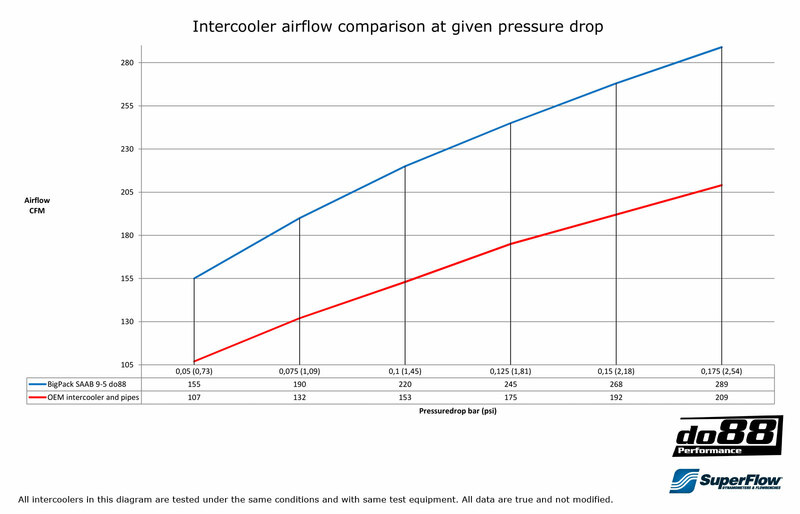 The perception of an intercooler being something to upgrade only after a major engine tune is false, yet widely spread among customers and car people. During hot Swedish summer days, at repeated pulls, inspired driving or even at ordinary driving in a hotter climate area, it doesn't take much of an effort from the engine to generate dangerously high inlet temperatures even on a standard, non-tuned, car. 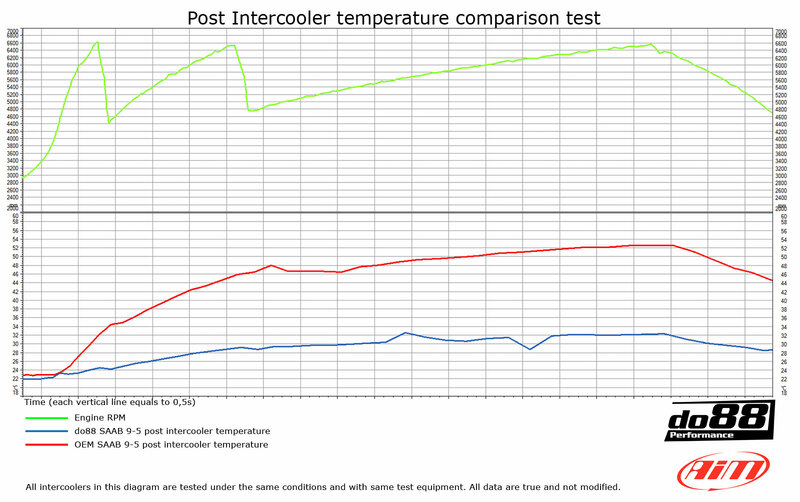 The cooling capacity with an OEM-intercooler is in many cases inferior which will affect the usable power outtake. The heat has to be eliminated, or else the promised output will be decreased as you start giving gas. With our intercooler you can rest assured the power is there, at all times. The RIP-kit included in this BIG-PACK is manufactured from 2,5 " extruded aluminum piping, mandrel bent to desired shape. Compulsory for all of our RIP-kits is them being constructed with smooth radiuses, forgiving transitions and as big inner diameter as possible. All in order to achieve as high airflow as possible and reduced pressure drop. This product comes with everything necessary for an easy installation, without the need for cutting or in any way changing the car̴åÇs original shape. Bolts, nuts, brackets and mounting instructions is of course included. Choose what color you would like in your hoses blue, black or red. There are no difference in performance between the three. * If you have a MY 1999-2001, some modifications may be required! *All tests are performed with the same test equipment during the exact same conditions and is therefore valid for comparison.